In recent years, Linux distributions have increasingly transitioned from other init systems to systemd. Thesystemd suite of tools provides a fast and flexible init model for managing an entire machine from boot onwards. In this guide, we'll give you a quick run through of the most important commands you'll want to know for managing a systemd enabled server. These should work on any server that implements systemd (any OS version at or above Ubuntu 15.04, Debian 8, CentOS 7, Fedora 15). Let's get started. The basic object that systemd manages and acts upon is a "unit". Units can be of many types, but the most common type is a "service" (indicated by a unit file ending in .service). To manage services on asystemd enabled server, our main tool is the systemctl command. All of the normal init system commands have equivalent actions with the systemctl command. We will use the nginx.service unit to demonstrate (you'll have to install Nginx with your package manager to get this service file). By default, most systemd unit files are not started automatically at boot. To configure this functionality, you need to "enable" to unit. This hooks it up to a certain boot "target", causing it to be triggered when that target is started. There is a great deal of information that we can pull from a systemd server to get an overview of the system state. By default, this will show you entries from the current and previous boots if journald is configured to save previous boot records. Some distributions enable this by default, while others do not (to enable this, either edit the /etc/systemd/journald.conf file and set the Storage= option to "persistent", or create the persistent directory by typing sudo mkdir -p /var/log/journal). While the above commands gave you access to the general system state, you can also get information about the state of individual units. By now, you know how to modify a unit's state by starting or stopping it, and you know how to view state and journal information to get an idea of what is happening with the process. However, we haven't seen yet how to inspect other aspects of units and unit files. This will give you the value of each parameter being managed by systemd. If you need to make a modification to a unit file, systemd allows you to make changes from thesystemctl command itself so that you don't have to go to the actual disk location. Another function of an init system is to transition the server itself between different states. Traditional init systems typically refer to these as "runlevels", allowing the system to only be in one runlevel at any one time. In systemd, "targets" are used instead. Targets are basically synchronization points that the server can used to bring the server into a specific state. Service and other unit files can be tied to a target and multiple targets can be active at the same time. Note that most operating systems include traditional aliases to these operations so that you can simply type sudo poweroff or sudo reboot without the systemctl. However, this is not guaranteed to be set up on all systems. For service management tasks, the target unit will be service units, which have unit files with a suffix of.service. However, for most service management commands, you can actually leave off the .servicesuffix, as systemd is smart enough to know that you probably want to operate on a service when using service management commands. If you are unsure whether the service has the functionality to reload its configuration, you can issue thereload-or-restart command. This will reload the configuration in-place if available. The above commands are useful for starting or stopping commands during the current session. To tellsystemd to start services automatically at boot, you must enable them. This will create a symbolic link from the system's copy of the service file (usually in /lib/systemd/systemor /etc/systemd/system) into the location on disk where systemd looks for autostart files (usually/etc/systemd/system/some_target.target.wants. We will go over what a target is later in this guide). This will return the current unit state, which is usually active or inactive. The exit code will be "0" if it is active, making the result simpler to parse programatically. So far, we have been working with services and displaying information about the unit and unit files thatsystemd knows about. However, we can find out more specific information about units using some additional commands. Within this directory, a snippet will be created called override.conf. When the unit is loaded, systemdwill, in memory, merge the override snippet with the full unit file. The snippet's directives will take precedence over those found in the original unit file. For instance, there is a swap.target that is used to indicate that swap is ready for use. Units that are part of this process can sync with this target by indicating in their configuration that they are WantedBy= orRequiredBy= the swap.target. Units that require swap to be available can specify this condition using the Wants=, Requires=, and After= specifications to indicate the nature of their relationship. For instance, if you are operating in a graphical environment with graphical.target active, you can shut down the graphical system and put the system into a multi-user command line state by isolating themulti-user.target. Since graphical.target depends on multi-user.target but not the other way around, all of the graphical units will be stopped. 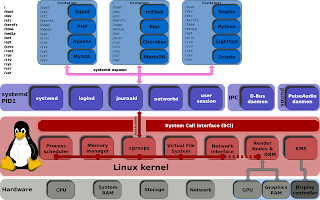 While systemctl operates mainly with the core systemd process, there are other components to thesystemd ecosystem that are controlled by other utilities. Other capabilities, like log management and user sessions are handled by separate daemons and management utilities (journald/journalctl andlogind/loginctl respectively). Taking time to become familiar with these other tools and daemons will make management an easier task. Some of the most compelling advantages of systemd are those involved with process and system logging. When using other tools, logs are usually dispersed throughout the system, handled by different daemons and processes, and can be fairly difficult to interpret when they span multiple applications.Systemd attempts to address these issues by providing a centralized management solution for logging all kernel and userland processes. The system that collects and manages these logs is known as the journal. One of the impetuses behind the systemd journal is to centralize the management of logs regardless of where the messages are originating. Since much of the boot process and service management is handled by the systemd process, it makes sense to standardize the way that logs are collected and accessed. Thejournald daemon collects data from all available sources and stores them in a binary format for easy and dynamic manipulation. The systemd journal can either be used with an existing syslog implementation, or it can replace thesyslog functionality, depending on your needs. While the systemd journal will cover most administrator's logging needs, it can also complement existing logging mechanisms. For instance, you may have a centralized syslog server that you use to compile data from multiple servers, but you also may wish to interleave the logs from multiple services on a single system with the systemd journal. You can do both of these by combining these technologies. While you will commonly want to display the information from the current boot, there are certainly times when past boots would be helpful as well. The journal can save information from many previous boots, sojournalctl can be made to display information easily. You can use journalctl to display only messages of a specified priority or above by using the -poption. This allows you to filter out lower priority messages. RuntimeMaxUse=: Specifies the maximum disk space that can be used in volatile storage (within the/run filesystem). By setting these values, you can control how journald consumes and preserves space on your server. If you wish to modify the way that a unit functions, the best location to do so is within the/etc/systemd/system directory. Unit files found in this directory location take precedence over any of the other locations on the filesystem. If you need to modify the system's copy of a unit file, putting a replacement in this directory is the safest and most flexible way to do this. * .socket: A socket unit file describes a network or IPC socket, or a FIFO buffer that systemd uses for socket-based activation. These always have an associated .service file that will be started when activity is seen on the socket that this unit defines. * .device: A unit that describes a device that has been designated as needing systemd management byudev or the sysfs filesystem. Not all devices will have .device files. Some scenarios where .deviceunits may be necessary are for ordering, mounting, and accessing the devices. * .mount: This unit defines a mountpoint on the system to be managed by systemd. These are named after the mount path, with slashes changed to dashes. Entries within /etc/fstab can have units created automatically. * .automount: An .automount unit configures a mountpoint that will be automatically mounted. These must be named after the mount point they refer to and must have a matching .mount unit to define the specifics of the mount. * .swap: This unit describes swap space on the system. The name of these units must reflect the device or file path of the space. * .target: A target unit is used to provide synchronization points for other units when booting up or changing states. They also can be used to bring the system to a new state. Other units specify their relation to targets to become tied to the target's operations. * .path: This unit defines a path that can be used for path-based activation. By default, a .service unit of the same base name will be started when the path reaches the specified state. This uses inotify to monitor the path for changes. * .timer: A .timer unit defines a timer that will be managed by systemd, similar to a cron job for delayed or scheduled activation. A matching unit will be started when the timer is reached. * .snapshot: A .snapshot unit is created automatically by the systemctl snapshot command. It allows you to reconstruct the current state of the system after making changes. Snapshots do not survive across sessions and are used to roll back temporary states. * .slice: A .slice unit is associated with Linux Control Group nodes, allowing resources to be restricted or assigned to any processes associated with the slice. The name reflects its hierarchical position within the cgroup tree. Units are placed in certain slices by default depending on their type. * .scope: Scope units are created automatically by systemd from information received from its bus interfaces. These are used to manage sets of system processes that are created externally. Assert...=: Similar to the directives that start with Condition, these directives check for different aspects of the running environment to decide whether the unit should activate. However, unlike theCondition directives, a negative result causes a failure with this directive. WantedBy=: The WantedBy= directive is the most common way to specify how a unit should be enabled. This directive allows you to specify a dependency relationship in a similar way to theWants= directive does in the [Unit] section. The difference is that this directive is included in the ancillary unit allowing the primary unit listed to remain relatively clean. When a unit with this directive is enabled, a directory will be created within /etc/systemd/system named after the specified unit with .wants appended to the end. Within this, a symbolic link to the current unit will be created, creating the dependency. For instance, if the current unit has WantedBy=multi-user.target, a directory called multi-user.target.wants will be created within /etc/systemd/system (if not already available) and a symbolic link to the current unit will be placed within. Disabling this unit removes the link and removes the dependency relationship. One of the basic things that should be specified within the [Service] section is the Type= of the service. This categorizes services by their process and daemonizing behavior. This is important because it tellssystemd how to correctly manage the servie and find out its state. simple: The main process of the service is specified in the start line. This is the default if the Type=and Busname= directives are not set, but the ExecStart= is set. Any communication should be handled outside of the unit through a second unit of the appropriate type (like through a .socketunit if this unit must communicate using sockets). notify: This indicates that the service will issue a notification when it has finished starting up. Thesystemd process will wait for this to happen before proceeding to other units. TimeoutSec=: This configures the amount of time that systemd will wait when stopping or stopping the service before marking it as failed or forcefully killing it. You can set separate timeouts withTimeoutStartSec= and TimeoutStopSec= as well. OnStartupSec=: This directive is similar to the above timer, but in relation to when the systemdprocess itself was started. %p: This references the unit name prefix. This is the portion of the unit name that comes before the@ symbol. %f: This will be replaced with the unescaped instance name or the prefix name, prepended with a/. %c: This will indicate the control group of the unit, with the standard parent hierarchy of/sys/fs/cgroup/ssytemd/ removed. Breaking functionality such as activation logic into separate units not only allows the internal systemdprocesses to optimize parallel initialization, it also keeps the configuration rather simple and allows you to modify and restart some units without tearing down and rebuilding their associated connections. Leveraging these abilities can give you more flexibility and power during administration. By learning how to leverage your init system's strengths, you can control the state of your machines and more easily manage your services and processes.